1897. Mucha's painting often feature beautiful women in flowing neoclassical looking robes, surrounded by lush flowers which form haloes behind the women's head. In this painting Mucha went all out with a most opulent design. 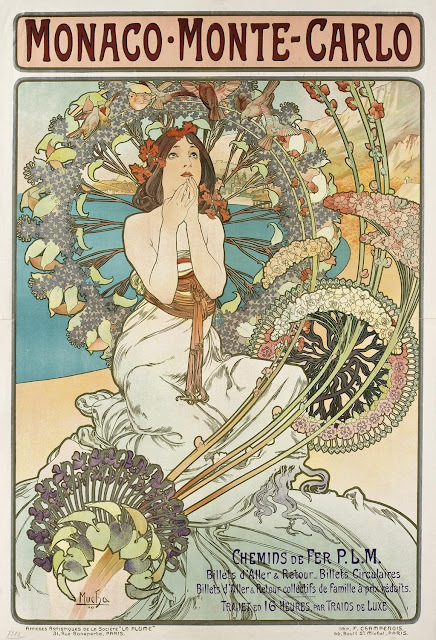 The shy maiden, kneeling, is completely encircled by the curving stalks of lilac and hydrangea, featuring some of the most intricate flower scenes ever painted by Mucha. It is probable that the design is meant to suggest the tracks and wheels that convey the public to Monte Carlo. The maiden is probably Spring herself, enraptured with the beauty of the seascape.